ALL RELAY TEAMS ARE INVITED!!! Dakota Track and Field athletes, Jacob Bonacorsi and Brennan Buckner assist a runner (Vince Biondo) in the 800m run at the District Special Olympics field day on April 30th, 2013. Dakota Track & Field Alumni at the MAC Championships meet at Kent State University this past weekend. Kyle Allinder (2010)-Central Michigan and Lauren Burnett (2013)-Kent State. 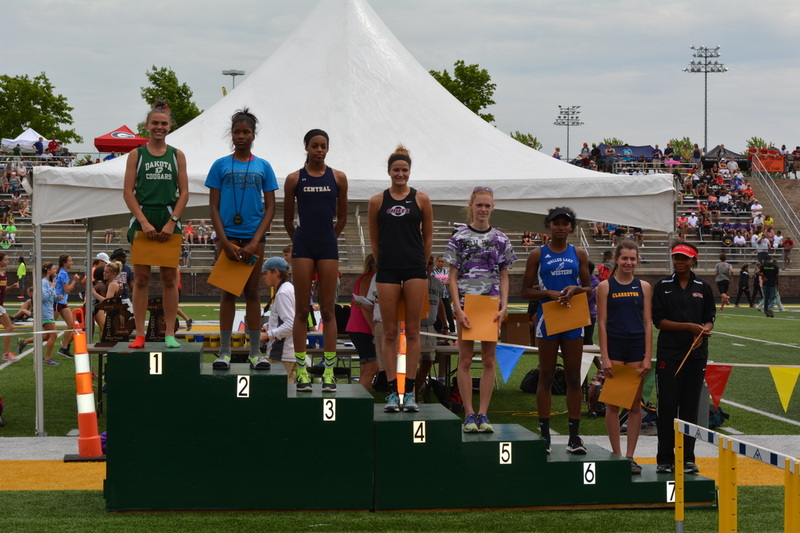 Both athletes placed 5th in the 800 meters. Kyle ran 1:51.68. Lauren ran 2:10.77 helping her team win the team title. She was the only Freshman to medal in the 800m run. Dakota Track & Field alumni at the GLIAC track & field meet at Hillsdale college this past weekend. (From Left to Right) Phil Baldick(2009)-Wayne State, Lindsay Bartz(2013)-Wayne State, Jennifer Schornak(2011)-Grand Valley, Christina Micale(2013)-Saginaw Valley, Dayle Micale(2011)-Saginaw Valley, Nick Culbertson(2011)-Wayne State and Brandon Hein(2011)- Lake Superior State. In the meet Jennifer Schornak place 3rd in the pole vault with a personal best of 12’ 7.5” and qualified for the indoor national meet to be held in North Carolina. Stephanie Cuniberti(2010)-Uof D, tied for 3rd in the High Jump at her conference meet. · Dakota Track and Field was established in 1996. · The program has produced 35 college track & field athletes so far. · The program has had 31 All State athletes.